Beyond the confines of school and town, Vicesimus II was widely known as a writer. His popular anthologies and views on education were well thought of by such people as Jane Austen and Dr Johnson, and he was even awarded a doctorate by a college in America. 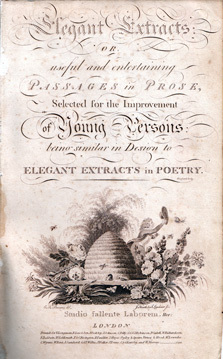 His best-known work, an anthology entitled ‘Elegant Extracts or Useful and Entertaining Passages in Poetry’ was published in 1784, and was followed a year later by a similar volume of prose. The latter was recommended by George Austen to one of his sons, Francis, when he left home for a career in the navy. His daughter, the novelist Jane, owned a copy which she gave to her niece Anna. The poetry version is referred to in Jane’s novel ‘Emma’. Knox’s success as a teacher was reflected in an increase in the number of boys in the school from 20 to 80 during his headship. 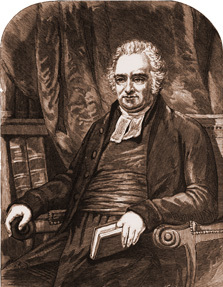 There was a temporary decrease in the 1790s however after he aired controversial views on pacifism while preaching in Brighton. Members of a Sussex regiment, stationed nearby, took exception and there was a public confrontation in the local theatre a few days later at which Knox was forced to make a hurried exit. Knox's educational ideas appeared in ‘Essays, Moral and Literary’ in 1778 and ‘Liberal Education’ three years later. The latter included his his views on female education which he thought important as women were so influential in their children’s pre-school education. 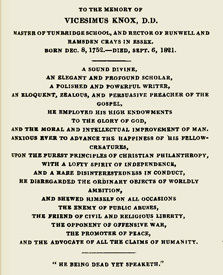 Knox was an outspoken champion of the grammar schools run by Livery Companies which include Tonbridge School and Merchant Taylors’ where he himself was educated. Vicesimus Knox II died in Tonbridge in1821 and is commemorated by a memorial in the Parish Church which describes him as ‘an elegant and profound scholar’ and ‘a zealous eloquent and persuasive preacher’ who was ‘the opponent of offensive war, the promoter of peace’. The Knoxes are also remembered in the name of Knox House, one of the day-boy houses at Tonbridge School. Knox Lane, which ran along the southern flank of the school grounds, was later renamed Lansdowne Road.